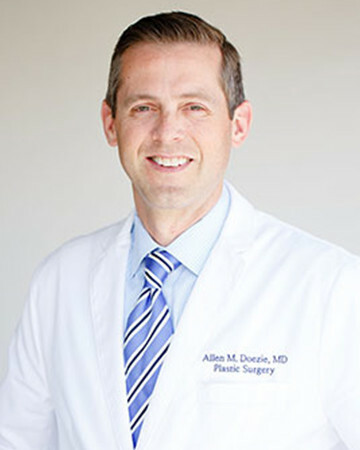 Dr. Allen Doezie is board-certified in plastic surgery by the American Board of Plastic Surgery and has serviced the South Orange County area since 2004. He is on staff at many of the local hospitals including Mission, Mission Laguna Beach, Saddleback Laguna Hills, and Hoag. He has also served on various committees including the surgical executive committee and trauma committee. Dr. Doezie applies his professional expertise and amiable, approachable demeanor to give his patients the comfort and care necessary when undergoing life-changing enhancement surgery. Dr. Doezie currently resides in Ladera Ranch, California. He and his wife Kelli have been blessed with four incredible children who enrich their lives and keep them busy. When outside of the operating room, he spends most of his free time in the company of his family. Undergoing any cosmetic enhancement is a personal and significant decision, and finding a qualified, experienced surgeon is essential for having a fulfilling plastic surgery experience. Dr. Doezie takes the time to listen and understand his patients’ needs and provides them with the necessary information they need before their procedure. He employs a caring and knowledgeable staff that offers each patient comfort and support through every step of the process, from consultation to postoperative visits. Developing trust with your surgeon is of paramount importance, and Dr. Doezie welcomes all patients with the sincerity and compassion to foster that bond. Among his academic achievements, Dr. Doezie has also been recognized in the media for his exceptional surgical skill. He was featured on the PBS Wellness Hour and was voted “Hidden Gem” in the 2009 issue of the Orange County Register’s Best of OC Guide. The Pulitzer Prize-winning Orange County Register belongs to the Southern California News Group, which distributes local news, politics, and entertainment via paper and online resources. "I have been a patient of Dr. Doezie's for many years now and I wouldn't think of trusting anyone else with my plastic surgery needs. He is a magician of a surgeon, knowledgeable, easy to talk to and gentle. The entire staff is excellent. The office is clean, beautiful and peaceful." "Mission Plastic Surgery is a fantastic team of people that make you feel important and treat you like a friend. Dr. Doezie's work is impeccable. I highly recommend him." "Dr. Allen Doezie is an amazing surgeon who exhibits excellent professional integrity, is highly knowledgeable in the field of plastic/cosmetic surgery, and is well-respected in the South Orange County medical community. After careful consideration, research, and numerous recommendations, I confidently chose Dr. Doezie to be an integral part of my medical team to assist me through my breast cancer journey from surgery to reconstruction. I am extremely pleased with my outcome and appreciative of the support and confidence Dr. Doezie and his staff provided for me. I am a medical professional and with absolute certainty would recommend Dr. Allen Doezie to my patients, colleagues, friends and family." Start your journey to a more amazing you today. Our friendly, courteous staff is available to answer any questions or concerns you may have and to help schedule your consultation. We eagerly wait for our relationship to begin!